Best trip ever? 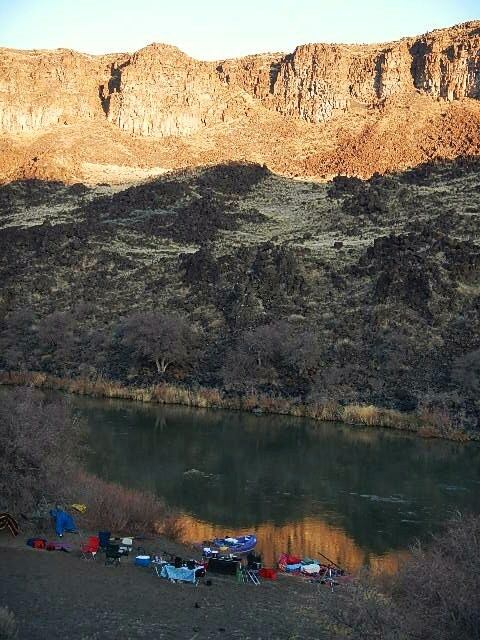 I just got off a 6-day Owyhee River trip that I like to refer to as the Estrogen Express on Little Grand Canyon North. Being the only male in a party with three females, has its challenges. But fun! In fact, so much fun, that one guest (I won’t mention your name here Terri) told me it was her best trip ever. This is always a welcome but troubling thing for me to hear after the completion of any river trip that people have enjoyed so much. It is a bit embarrassing and I am tempted to fudge the truth a little and agree, but then what about all those other super trips in the past I have been on? Like the trip where I proposed marriage to my wife by scribbling with a stick on a magnificent sandbar in an outrageous canyonscape. Once someone in my profession gets nearly 40 years worth of trips behind them, that adds up to a lot of trips and happy times. I would not like to discount any of those other great experiences, or rank them in any kind of order. Minus a trip or two from hell, most of my experiences have been highly pleasurable. And I certainly would put this past one up their in the high level redline of the fun meter. In fact, despite getting occasionally ganged up on, almost all female trips I have led have been a real hoot. That is, at least gaged by the soreness of my guts during the trip of belly laughs that almost took me rolling to the sand. Good humor adds so much to an adventure that it is easy to send them to the top ranking positions of how much fun one journey can be. It almost makes me think perhaps all female (or mostly female) trips might be a good niche market to consider. Although, it might lead to early insanity and is always a risk for potential male ill-mind health. In essence, what is really fun for me is to see the transformation that takes place between launch and take out, especially for those whom are on their first time on a river or a new one. 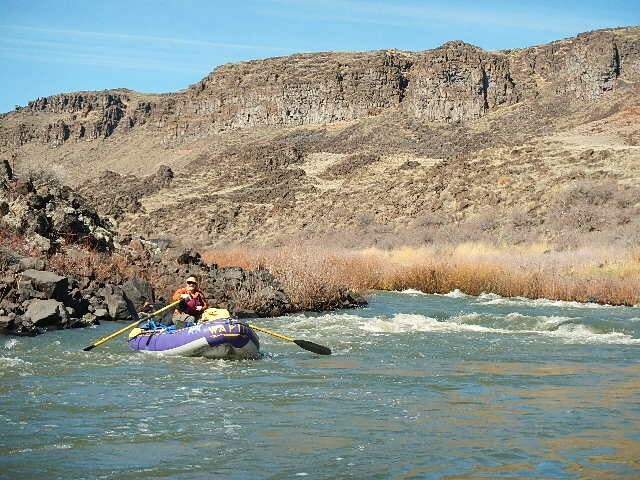 These ladies had all been on other river trips, and two of them, on the Owyhee before. But each water level is never exactly the same, so essentially a new river. Of course, the group dynamics were different, and fortunately a great mix of compatible personalities, so that adds significantly to the pleasure principle. And of course, for Misty, who was rowing the other raft and guides for us here at the Wapiti Clan, had not been on this waterway before. 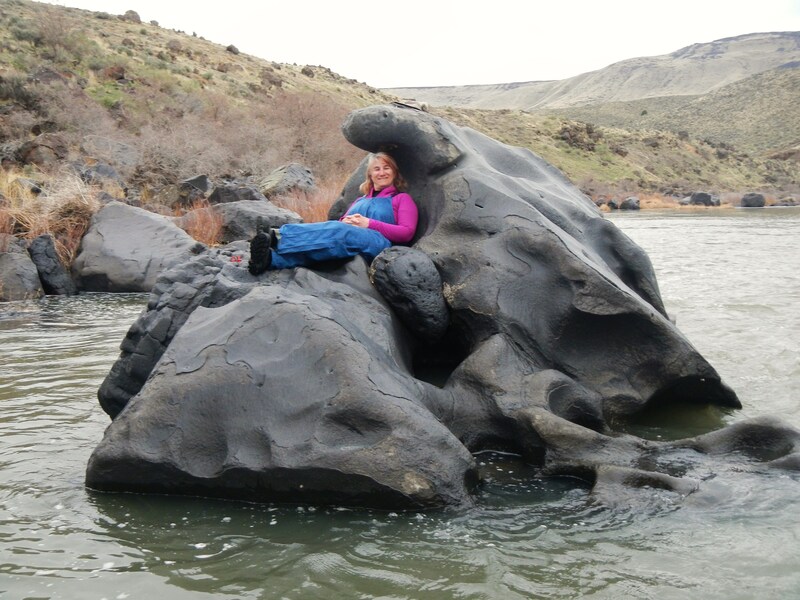 The low water conditions were a far different experience than the big water of the Salmon River that she is used to. But, being good on the oars and reading water helped her to successfully make good runs. 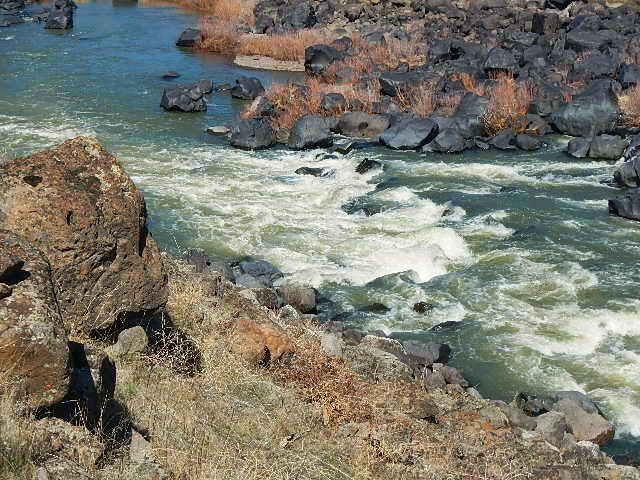 The technical aspect of bony boulder garden rapids actually makes one better on the sticks when they get back to larger volume rivers. 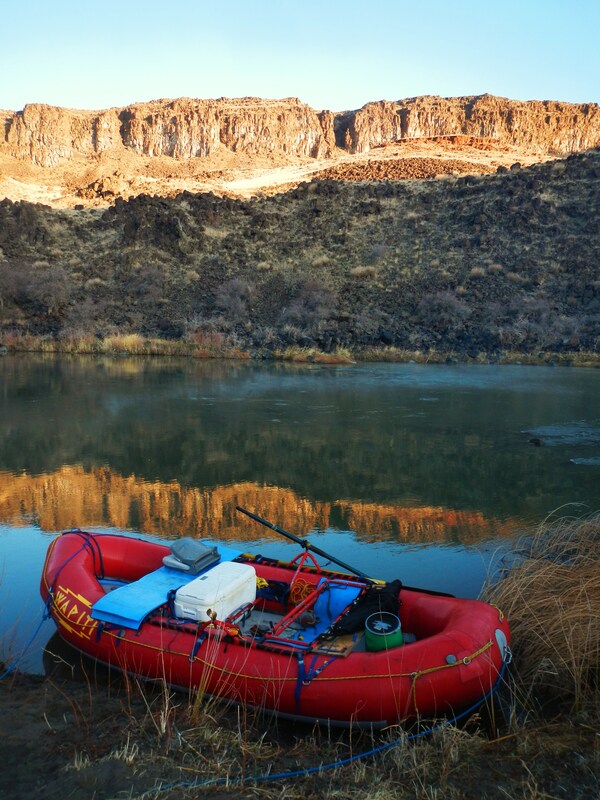 I’m sure she will soon appreciate it once the dust has settled and her memory kicks-in to help finesse a good route through the challenging rapids of the Salmon River. And so it is with a river experience. When we align ourselves with all the current, not only of the river, but everything else that flows between the canyon walls, we become the vessel through which it all pours. We can absorb all the juices that leaves a stain forever on our inner walls…and add that much more to the next time we dip that same straw into the flowing waters. Fortunately, there are a lot of best trips ever, soon to be, laying there in wait for another vessel to appreciate it once again. It is the way of the river and waters magic. Gary, I can sure relate . . . I did several trips with all female participants; some were with a half-dozen or so, gang [or mob?] of Special Education teachers (“Speds”) that were a handful as well as a mind-full! Glad someone out there could relate. Mind-full reinforcement is always nice for us males when totally surrounded by a circle of estrogen. But they didn’t make me go crazy, as that is a pre-requisite attribute to have in order to even consider doing such a trip in the first place. Since they were all as crazy as me, we all got along fine and could relate (in a ying yang sort of way). Better for me to be thanking you, as it is people like you whom make my profession possible to begin with. And I am glad you can feel the river’s magic and appreicate its raw power. It appears you have caught the river bug in your blood ever more deeply now. Only this is a good bug to catch, as it really is a medicine that can work wonders on your soul. I was asked today if I wanted to change careers again and become a river guide. Since I’ve been back, I’m more relaxed and content. Someone even said my face glowed. (and it’s not sunburned) Do you think you could teach me to row straight down a river instead of in circles? I sure hope to take a trip with you two someday, thank you for sharing the wonderful stories and beautiful adventures. I am glad you like my adventure stories, and look forward to the time you can make a trip with us to contribute your own story to the mix. The true beauty of adventure is that no one can get to the end of it without having made an impactful life story from the experience. I will have to admit to the positive aspect of the estrogen influence and being victim to it is one I don’t mind. A good balance between the two elemental forces that unite to form life is required for harmony to exist between the sexes. You captured the essence and mood of the canyon very well in your prose. 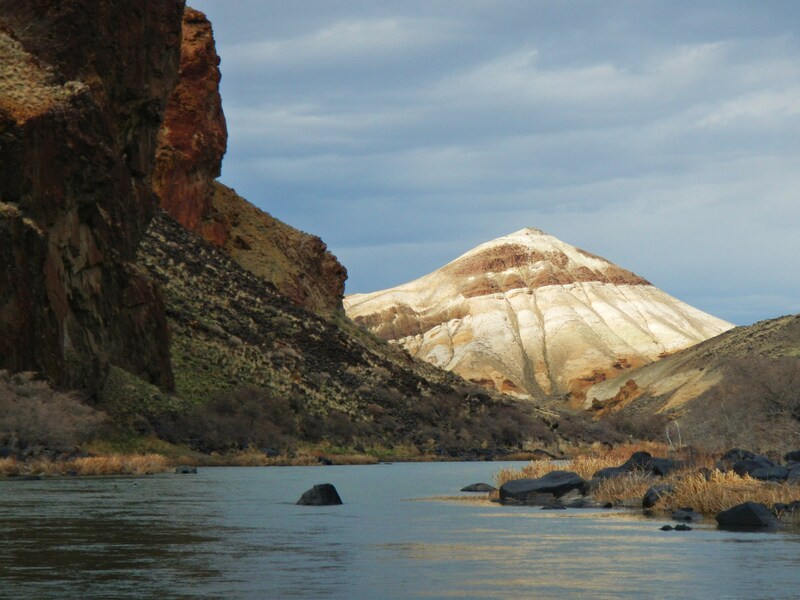 Even though there was much laughter and fun spirited banter on our trip, it is sometimes easy to lose track of all those other transformational influences the river weaves through our psychy. So thanks for capturing that aspect very well. Solitude isn’t for sissy’s, as it is a place to confront the very core of your own personality. Utterly no abstractions, just you and nature, face to face. 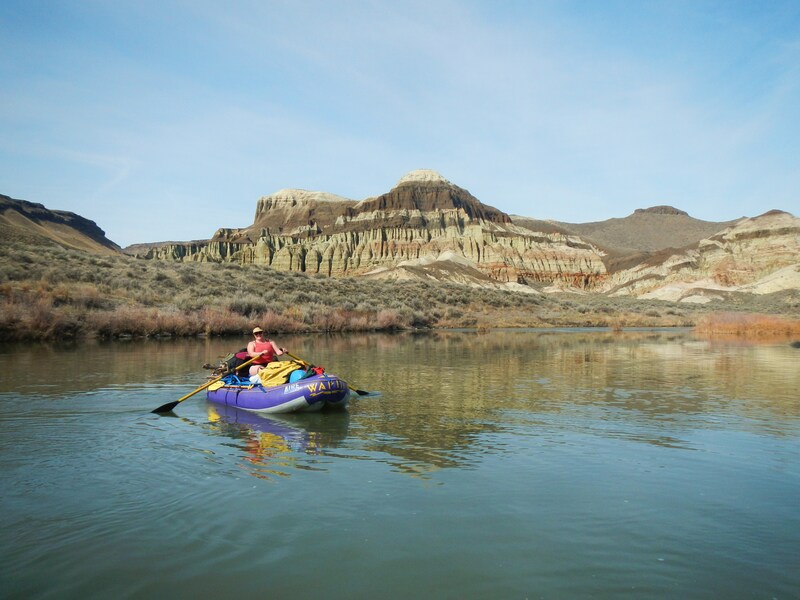 And yes, I hope it is not your last trip to this magical place, and couldn’t biasly agree with you more – if you have not run this river you should, and Wipiti Wapiti is the way to go.